It’s not every day that you’re asked about your Sunday training run by someone who’s ridden the Tour de France. That’s typical Stan Brittain, for you. Tall, straight-backed with neat hair and bright blue eyes, Stan Brittain is every bit the quiet, modest gentleman that I’d been told to expect. 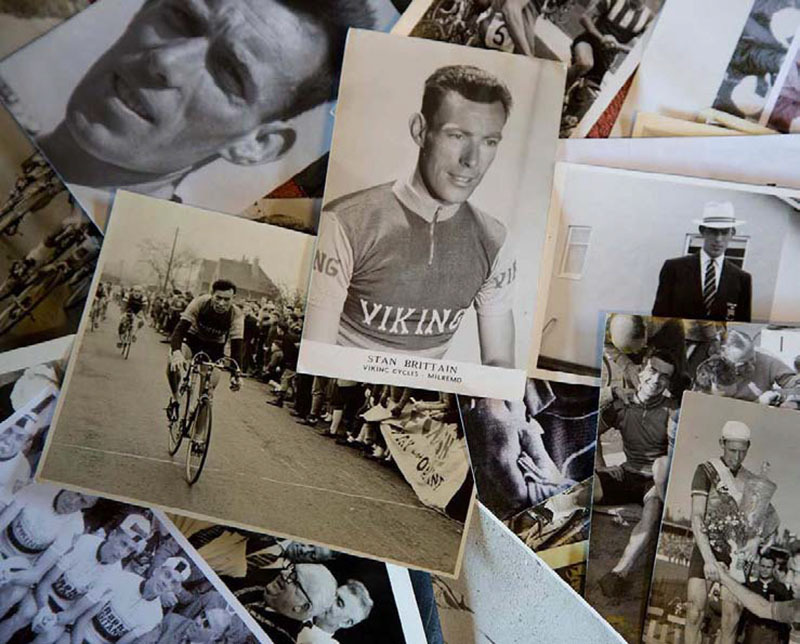 Born in Knotty Ash in 1931 Stan’s one of the originals – a select group of British riders who rode the Tour in the 1950’s and early 1960’s, shoulder-to-shoulder with Louison Bobet, Frederico Bahamontes and Jacques Anquetil. 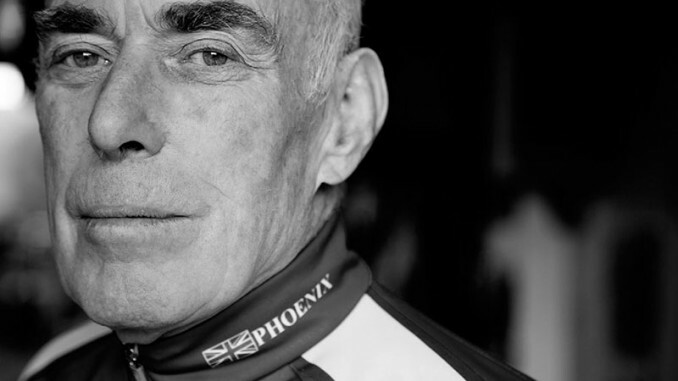 He was a domestique supporting Brian Robinson on the 1958 Tour and ended up being only British rider to finish and, at the time, was only the third-ever British rider to finish. 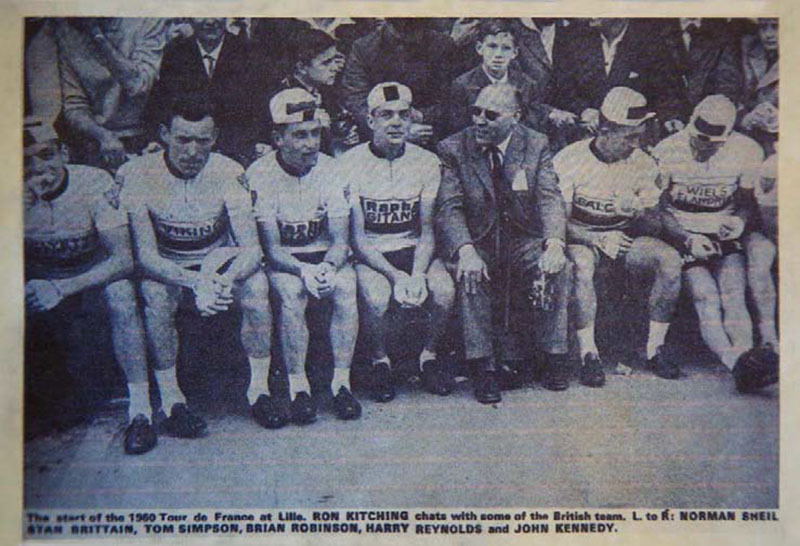 Between 1949 and 1960, Stan rode for Great Britain and won a silver medal in the team road race during the 1956 Melbourne Olympics. 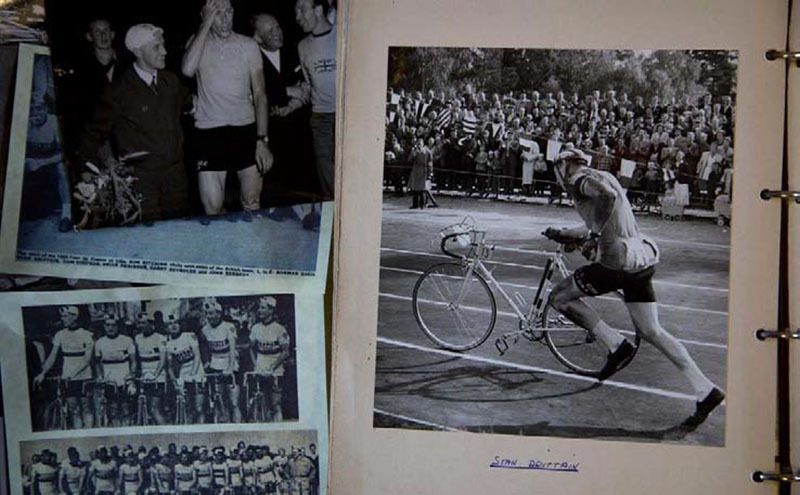 He also rode the Peace Race – the Eastern block version of the Tour de France – four times, finishing an impressive third in 1956 and second in 1957. Stan retired as a professional bike rider when he was 33, but has been involved with his local cycling ever since. 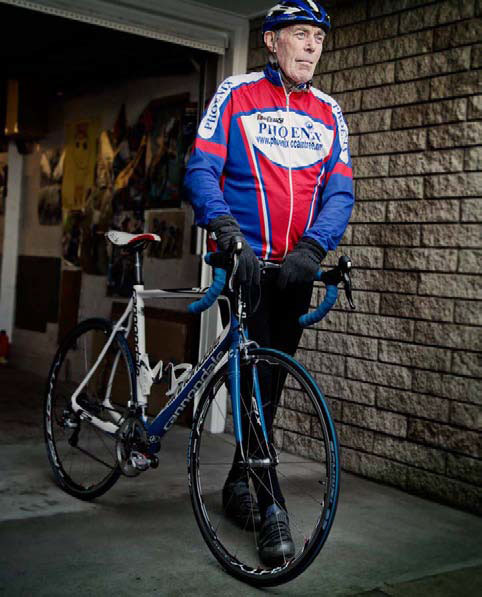 He has been a member of the Aintree Phoenix for more than 60 years and still gets out on the bike whenever he can. I’d first seen Stan in 2007, when I was out on a ride with one of our older club riders in the Liverpool Mercury, Jim Kay. “Are you going to go talk to him then,” I replied. But at the age of 72, Jim suddenly became like a shy schoolboy. “Oh no. I couldn’t,” he insisted, before I ushered him on and hung back. Jim caught Stan up and had a chat before their routes diverged at the next junction. DK: Stan. It’s great to meet you. I’ve seen the back of you once. SB: [Smiles. Get’s up and turns his back to me] Was this me? DK: Yes. That’s you. So tell me , ow did you get into racing? SB: You have to go back to the late 40’s, I suppose. I first started riding a bike as just transport when I was 13-14. Everybody did. If you were serious, you joined a club eventually. I was in the YHA club in Huyton and then five or six of us formed the Woolton Wheelers in 1949. It ended up with about 30 of us. DK: And you began racing? SB: In 1949, a pal of mine in the Wheelers, Frank Fell, wanted to race in a club event up near Preston on what they called the Brock course. It was a 25-mile time trial, so we cycled up on the Saturday afternoon to a B&B in Garstang and then rode to Brock three or four-miles down the road for the race on the Sunday. At the start, they said to me ‘you aren’t on the this race – you’re on the overflow race on the Blackpool course’. I quickly cycled the 10-miles over to Preston, got there lathered in sweat with a few minutes to spare and then was off out of Preston on the Blackpool route. DK: So at least you were properly warmed up then? SB: Well, yes. In fact, it paid off. No-one warmed up really in those days, so I ended up beating the field by about three minutes. I caught the rider in front, a guy from the Century called Harry Dollington, who was quite decent. I didn’t know what to do, as I’d never caught anyone before. I felt a bit embarrassed having to go by him. Then Wally Watkins, who looked after riders in the Phoenix, asked me to join them. I rode with them for a year before National Service. 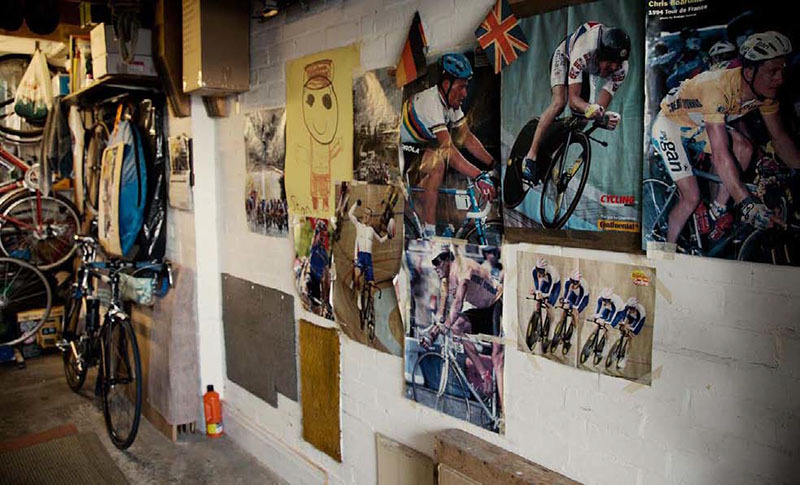 DK: So did cycling go on hold then for two years? SB: Well, actually, no. It worked out fine. I was posted to Catterick Camp in Yorkshire. I was in the Signals and did basic training for the first six months. At the time, the Korean War was on and Palestine was also an option. Palestine was dangerous – full of snipers. If you got posted to Korea, you’d better write your will before you left. I didn’t fancy any of that, to be honest. A chance to train as a drill instructor came up and, as my uncle was a drill instructor in the Coldstream Guards – he was nicked-named the loudest voice in the British Army – I thought that I’d rather be a drill instructor in Catterick than getting shot at in Korea. So here I stayed. DK: Tell me about the Army’s Northern and Western Commands. SB: I was in the Northern Command sector for the Army and the Western Command, which took in Merseyside, had some great riders – Brian ‘Robbo’ Robinson, Peter Proctor, Bernard Pusey, Les Wilmot and Billy McAtteer, from over the water. They were all top internationals, stars of the road and track. I’d be the kid hanging over the barriers as they flew past at Bootle track. Then Robbo was posted over to York and I began to train with him and a decent road man called Jimmy Greaves. As the third man, I was put into good events with them representing the Army. I was only a tupp’ny time trialler when I met them, so I was out of my depth at first but quite strong. There wasn’t a points system then, it all worked on merit. I managed to beat the King brothers from Coventry, Bill and Bernard, in a race. From then onwards, I was able to get into first class events on my own merit, as I’d won a race. DK: So in essence, the Army and the RAF were running a set of racing teams around the country? SB: Looking back, I think I had 400 days leave in the two years to train and compete. I rode at Catterick, the Isle of Man and something called the Leicester Forest race, which I won. We rode for Catterick Wheelers, Northern Army Command and even the Army Cycling Union. DK: And ‘Robbo’ became your tutor? SB: Yes. I learnt a lot from him – and from making mistakes. We once did a race in Derbyshire, which started in Macclesfield. We slept overnight at an RAF base at Harper Hill on the other side of the Cat and Fiddle, rode over the Cat to Macclesfield for the start and then back over the Cat and Fiddle, as well as a circuit around the Derbyshire. Now, I was never a climber. At over 6ft and 12st 4oz or more, I was OK for power, but for climbing, the power to weight wasn’t right. I’d seen the break go away with Robbo and a few climbers, but I worked really hard and got across to it. Robbo dropped off the back to tow me onto the break. I’d made my effort but I then saw Man Tor…and went backwards. It’s been shut for 30 years now since a landslide, but it was open in those days. I was almost crying on Man Tor. 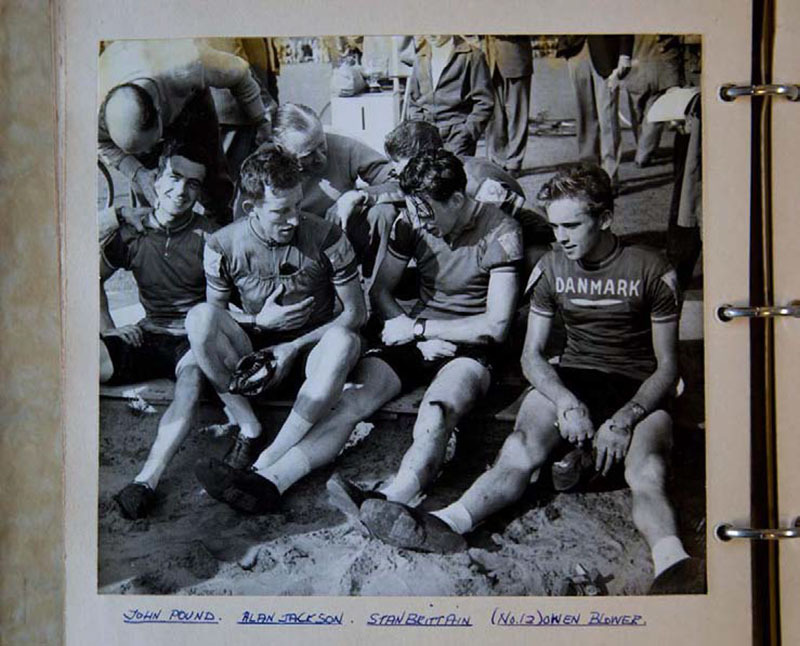 All good experience – know the route before you set out..
DK: Tell me about the the UCI World Road Race championship in 1953. SB: I’d done some decent rides and was quite a decent sprinter, if the group stayed together. I’d done the Tour of Ireland with the British ‘B’ team and won the Grand Prix of Kent, so I was chosen for Germany. It was near Cologne in West Germany. It absolutely chucked it down with rain. The course was uphill and downhill, as well as over a temporary bridge left over from the war – a pontoon with metal plates covering timber. The only flat part was the start/finish line. With about a lap to go, I touched wheels with someone and went down. I thought to myself ‘well, that’ll do me’. Then, unfortunately, some great big German policeman picked me up, put me back on my bike and pushed me off again. I think that I ended up about 18th – the first British rider. DK: What was the team kit like for that event? SB: Heavy. Especially in the wet. We had the woollen shorts, of course, and the top was also woollen – pockets back and front, with red, white and blue ‘V’s sewn onto the front. When this lot got wet, it weighed a ton. But that was what it was like. DK: You rode the Peace Race, which was the Soviet Block version of the TDF, four years in a row between 1955 and 1959. Coming third in 1955 and second in 1957? SB: Yes. The race went between Berlin, Prague and Warsaw – alternating the start city each year. The soviets were out to impress, so we were well-fed and looked after. They even had motorcycle police with us when we went out on training runs, stopping all the cars at junctions as we went through. DK: Was there a lot of local interest in the race? SB: At the time, almost more than the Tour. We’d start some stages in football stadiums and there’d be 50,000 people there just to see the officials setting up and us leaving the stadium. I suppose there wasn’t much else going on in those days. DK: You also rode some six-day stage races in Sweden? SB: The Tour of Sweden. It was a four-man team and we would have left on the Horwich ferry to whereever it was. The Swedish and Danish teams liked to take turns winning that race, so they weren’t happy when I led it for a while in ’56. We soon went down to three riders. That’s when the Swedes and Danes got together and worked us over. I ended up fifth in the end because they’d all ganged up on me. After the race, though, the Danes and Swedes got together and bought me a nice suede jacket as a sweetener. DK: And the following year, you got your revenge? SB: It was being led by a Dane called Dalgaard for the first three days. I was up there, or there about’s, so I went and talked to the Belgians and we agreed to work together. Tthen we had eight riders. The Belgian, Declercq, went into the lead and I was about a minute behind him going into the final day. The last day was a split stage day, a 60-70 mile morning road race and an afternoon 19-mile time trial. Our team got together on the last morning and I said ‘yesterday’s ‘combi’ is now history – today we have to attack the Belgians’. Alan Jackson was a minute down on me in third place, so I has the best option. As it happened, in the road race in the morning, I got away with two Danish lads. Declercq made a big effort to get on, but he never made it. I was then race leader. But going into stadium, I came down on the cinder track with 100 yards to go and ended up third. I was covered in grit and road rash with the chain off. I had to push the bike the last 100 yards. DK: So you entered the afternoon time trial injured? SB: Yes, but it was only skin. A bit of road rash – nothing broken. Declercq couldn’t make up the time I had in hand – even with the crash – and I won. He sat on my wheel when I came past him, which annoyed me, but I came second in the TT and so the race winner overall. You didn’t get prize money in those days – trophies, glassware, cameras. Cameras were very valuable then. Eastern Europe had great cameras. Over here in the 1950s, you couldn’t get them. I’d get them as prizes and sell them when I got back. 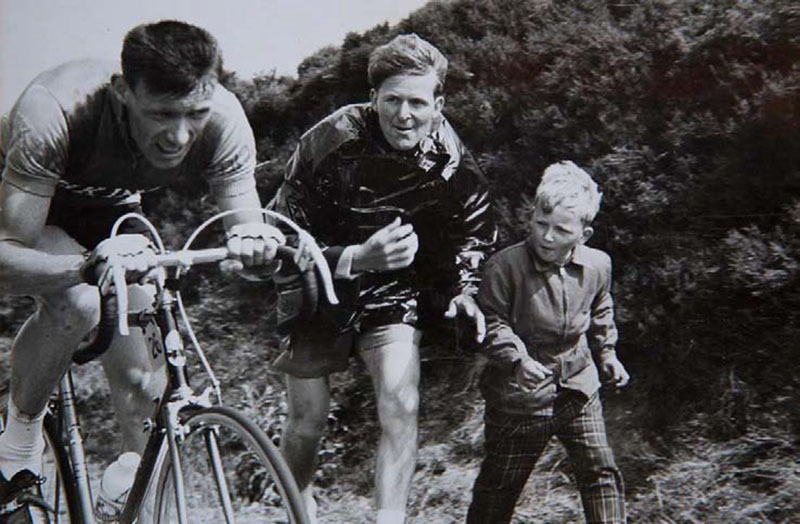 DK: Then came the Tour De France in 1958. It’s often a cliché when people say ‘it was harder in my day’, but with the TDF, it really was, wasn’t it? SB: The 1958 tour was 22 days. No rest day. The nearest thing to a rest day was a time trial up the Ventoux – and not only that. The last day was from Dijon to Paris, which was 200-miles. The years before that, the stages were even longer. No transfers. You did literally rode around France. DK: Before package holidays and quick flights all over Europe, it must have been very exotic riding abroad – especially the tour? SB: A different world – 1958 was the first time I’d actually raced in France. It was unknown territory. The Tour started in Brussells, so I knew that area, but we went off across Brittany and down to the Pyrenees. DK :Although the race was smaller in those days [the race started with 120 riders: 10 x12 man teams] you must have been excited? When you went to sign in the first day, how did you feel starting the actual Tour de France? SB: Well, you take things in your stride, don’t you? I didn’t appreciate at the time how big the Tour was really. Of course, the preparation before the Tour for the riders wasn’t like it is now. I was just riding races in Belgium. There was no training camps. We just met the night beforehand. I knew Robbo, of course, and Shay. DK: You were part of an international team? SB: Yes. We had of 12 riders in all. Three Brits – Robbo, Ron Coe and myself. Then there was Sheamus (Shay) Elliot, from Southern Ireland; four Danes; two Portuguese and two Austrians. DK: With no team training and roles, was there a plan? Were all the British riders there to support Robbo, as he’d finished 13th place the year before? SB: Well Robbo talked to Adolf Christian, the Austrian, who was in our team. He’d been third the previous year and so wasn’t interested in helping us. So with Shay, we just rode as our own unit within the team. DK: So you were at a disadvantage from the start? Four men against all the 12 man national teams and regional teams? SB: I know Robbo won a stage, but we were never in contention against the others. I was just there to support him and Shay to win stages. In all honesty, I always say ‘I rode the Tour De France’. I never say that I ‘raced’ it. DK: You didn’t expect to place with the ‘big hitters’? SB: No. I was just hoping to hang through the mountains and finish. The nearest thing to mountains that I’d done were the Maritime Alps in the South of France. I’d never been to the Pyrenees or the main Alps at all. One French journalist was most concerned about me getting over the mountains. I was concerned for myself as well. DK: You crashed in the first week? SB: I came down pretty hard on Stage 7 into the Brest – the stage that Robbo won. I’d cracked a couple of ribs and there were no team doctors in those days. The Tour doctor strapped me up and on I went. DK: But you were only a couple of days from the Pyrenees. It must have been a problem? SB: Well. By this point, the pain in my legs was already masking the pain in my ribs. DK: Any team bikes or kit? SB: Not in those days. We all ride our own bikes. We had two mechanics, but the equipment wasn’t interchangeable. If you got a puncture, you could use a team mates wheel. 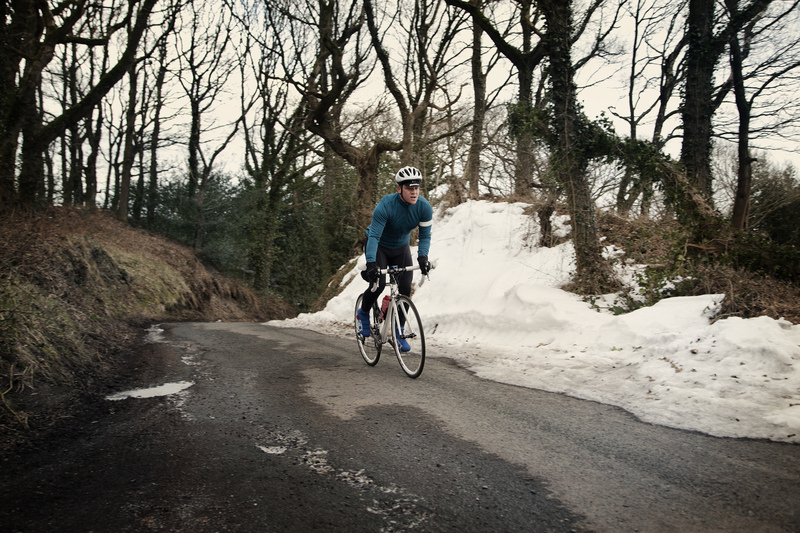 You would use the same bike for it all – road, mountains and time trials. No comparison between the equipment then and the equipment now. DK: What gears were you pushing? A 42/25 maybe? SB: Oh no. It was only a five-speed block on the back and 52/48 was the norm for the front. By the late 1950s, it could have been a 52/45 on the front. So maybe I was on a 45/25. DK: The heat must have been intense in the South of France during the summer? SB: We were wearing the white wool jersey’s, with a black band across the front, that were tour issue for international teams then. All the other riders were in woollen vests, too, though. DK: You weren’t allowed supplies or water from the vehicles? That couldn’t have helped? SB: People would hand you things from the road side and you never knew where they’d got it from. In the hot weather, you’d stop in a village and just dip your water bottle in the fountain – not the best of things to do. DK: I would have thought by then that people would have worked out the link between dehydration and heatstroke?. SB: Yes, but there were other things to worry about, weren’t there? We never did drink enough. When we rode domestic races, generally speaking, if the race was 80-mile or less you just carried one bottle. If it was 80-120 miles, then maybe two bottles. In the Tour, the real key was good health. You’d either crash, get a stomach bug or a chest infection, which was the easiest thing in the world over the mountains in wet wool. Robbo won the stage into Brest on day seven, but he abandoned with a couple of days to go. He had some kind of infection. Anquetil got pleurisy, I think, and abandoned as well. It wasn’t all hot weather. We had a bad rain day from Braincon to Aix-Les-Bains and 30 of us, including Baffi, finished outside of the time limit. Luckily, the conditions were classed as ‘extraordinary’ and so we stayed in. DK: Talking of rules, I hear there was a rule on the Tour about wheel spokes? SB: They were very strict in France. You had to have a certain spoke count on your wheels. The minimum that you could use for the Tour were 36/36, so the officials would check and give you a wheel from the service car if you had too few spokes. In those days, British riders would use 32/40 and I had to give up my front wheel and use a duff 36 spoke wheel that the officials gave me. DK: With no transfers, I suppose you were staying in hotels in the finish town each night and starting next morning? SB: There were no Ibis and the like then. We stayed in typical French family hotels. Coming from Britain, where rationing had only finished four years before, we were pretty happy with what we were given. There was one occasion, when someone from the British Diplomatic Service turned up to the Tour and asked us if we needed anything. I said ‘yes – a box of Cornflakes’. You couldn’t get cereals in France then. DK: The TDF finished at the Parc De Princes. From the English speakers in your team, there was just you and Shay Elliot left. No medal or brevet stamped. Must have been a strange anti-climax to finish like that? SB: There was an interview with a cycling magazine and a night in a hotel in Paris. Then we went our separate ways. I hadn’t an agent that year, so wasn’t riding any crits. For me, it just stopped and went flat. I was living in Kortrijk in Flanders then with Bernard Pusey and Ian Brown. We went down to Uzerche in Corréz and raced there. Sat in cafes, ordered a beer and a nice piece of cake. Watched the world go by – like you still can do in France. DK: Tell me about the Melbourne Olympics in 1956. I was amazed that it took five days to get there? SB: The road race was on the last full day of the Olympics on the Friday. Alan Jackson, Billy Holmes, Harry Reynolds and myself were the road team. The Suez crisis was on, so we couldn’t go via Egypt. Instead, we flew straight to Bahrain and then on to Colombo in Ceylon for the night. From there, we went to Singapore for two nights while we swapped planes. There was an RAF base in Singapore and we went on a bit of a ride with the RAF lads. Then onto Darwin and from there to Melbourne. DK: Tom Simpson attended those games? SB: ‘Simmo’ was with the track team, who went out a week before us. He was 18 when they went out and had his 19th birthday out there. He was a fantastic rider even then. Far better than me and most people – a class apart. We rode in the 1960 Tour together. DK: The Olympic road race was a combined individual and team event? 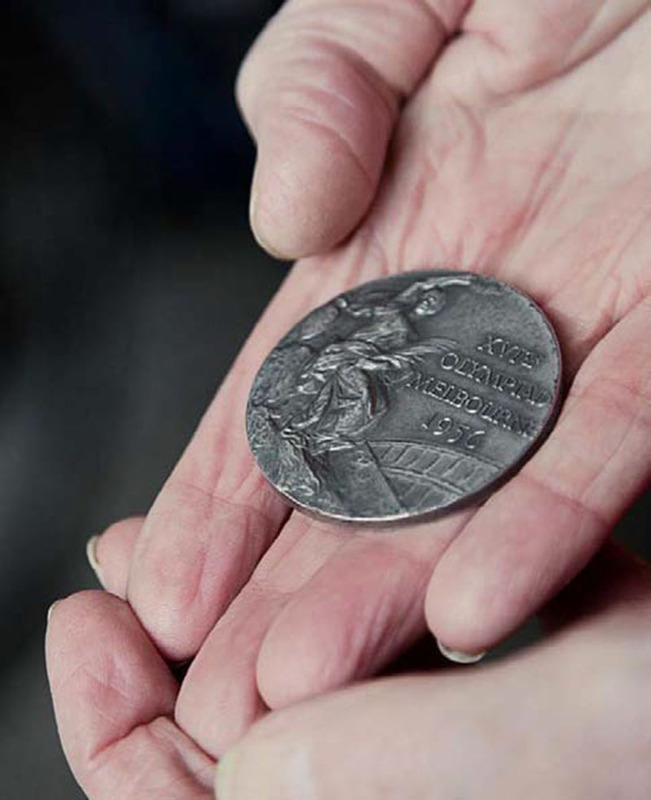 SB: Back then, first second and third were medal positions and, in those days, there was also a team award. The Italian, Baldini, was first and the Frenchman, Geyre, second. Jacko came in with two East Germans and beat them in the sprint. I led the next small group over so came sixth. With those two placings and Billy Holmes in 14th, we came in just a point behind the French and got the silver. DK: Did you get to see anything first hand at the 2012 Olympics during the summer? SB: We were eventually invited, late in the day, a few weeks before and asked to go to the Opening Ceremony and the road race. They’d had five to six years to organise invites, so I thought that was poor treatment. Harry Reynolds went with Tommy Godwin, but my wife wasn’t well and, with the notice given, I couldn’t go. When the Tour started in London in 2007, they treated us as if we’d won the blooming thing – never mind just finished it. For that, we were sent invitations to the team presentation 12 months beforehand. Then at the meal afterwards, our names were called out and we had to stand up to be presented to the press and the teams. We also had VIP tickets for the prologue. It was very special. DK: You train on the same roads and frequent the same cafe as another local Tour de France rider, but have you met Wiggins? SB: I’ve seen him out on the road now and again. We’ve let on to each other, as cyclists do. He always says ‘hello’ to everyone. 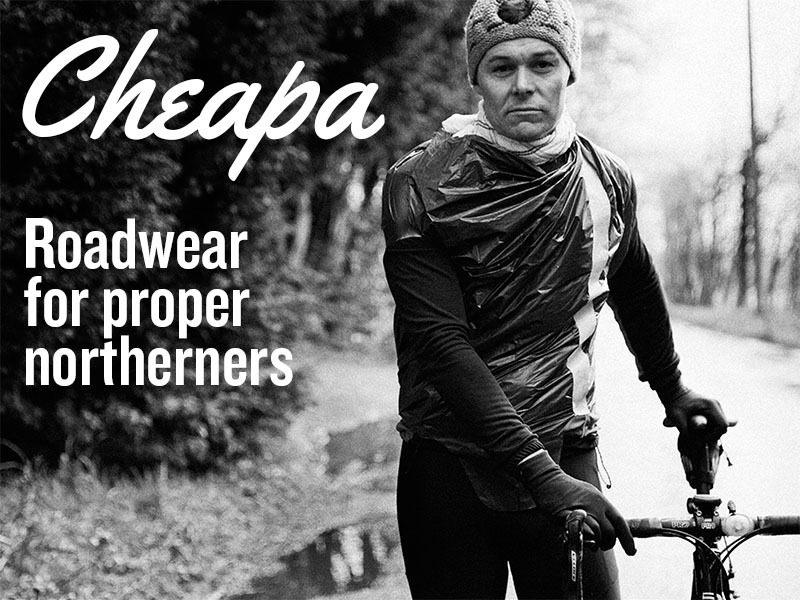 He’s only a bike rider after all – although quite a good one obviously.